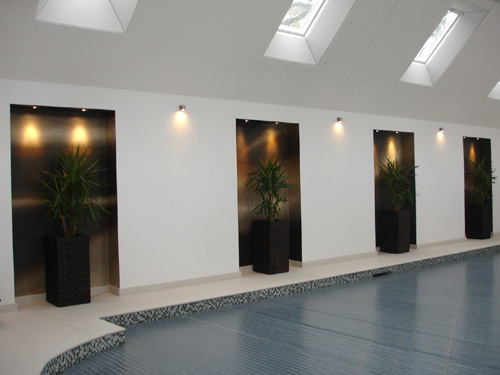 A huge indoor swimming pool had this lovely space on a wall in the centre of the pool, the room needed something quite impressive to give it some life. A pure black background then painted with earthy browns, siennas, white & hints of gold. A deep brown background then painted with earthy browns, Siennas, White, hint of gold. Hand Painted using Metallic Acrylic paints then spray matt varnished. A single spotlight highlights the buddha in exactly the right places to highlight the coppers and golds to make it ever more 3D. 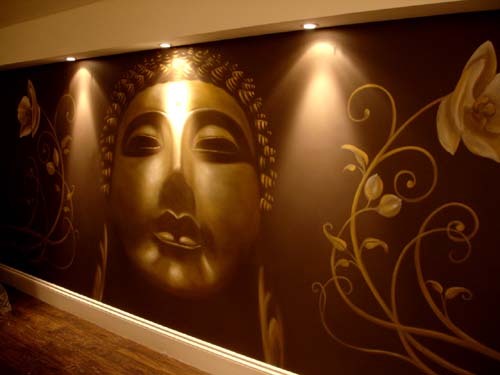 I used the same background colour as they have used on some of the other walls in the salon to compliment the decor in the rest of the salon. 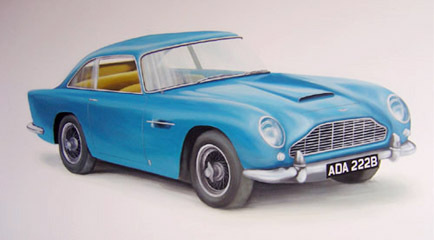 Hand Painted using Metallic Acrylic paints then spray matt varnished. Three spotlights light up the buddha in exactly the right places to highlight the copper and gold colours and make it ever more 3D. I used the same background colour as they have used on some of the other walls in the salon to compliment the rest of the salon decor. 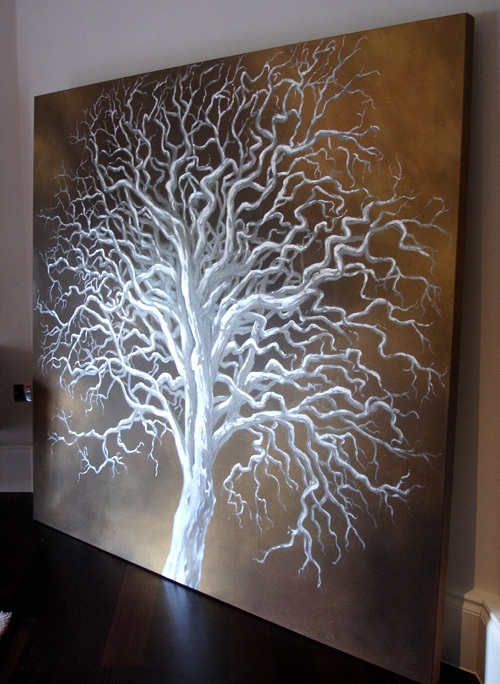 This canvas was displayed in a room with a lot of natural light and looked completely different at different times of the day due to the light reflecting on the silver metallic paint. Created a surface for extra texture for the gold paint. 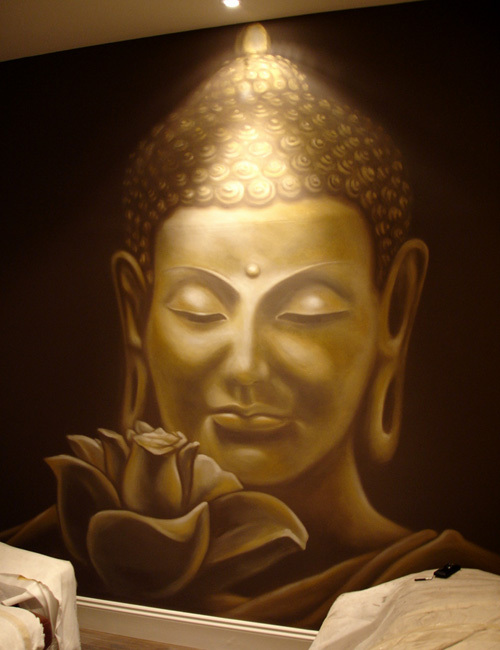 The Buddha was then sketched on and hand painted on to a deep canvas using deep siennas, copper and Metallic paints. 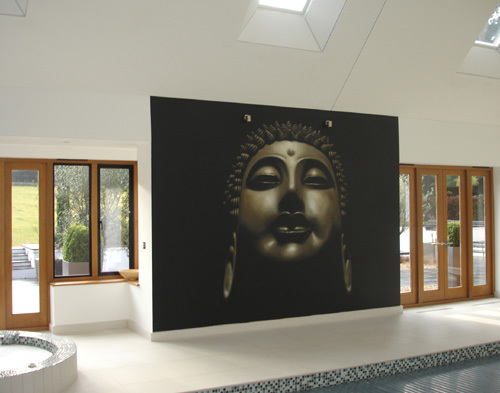 These canvases can look very different in different lights due to the reflective metallic paint.